Up 180 children from various schools have been learning in the classroom about different industries this year as part of Cheshire West and Chester Council’s Raising Aspirations Project. 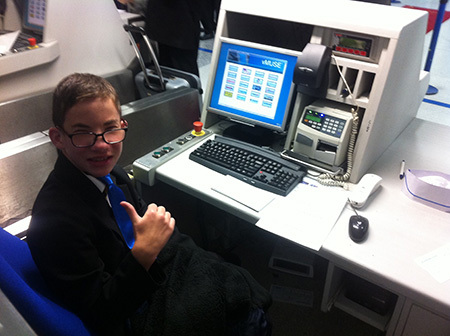 Their work culminated in a trip to Manchester Airport where they took part in activities which complemented the national curriculum and gave an insight into a future career at the airport. Activities included the children taking part in role play scenarios as check in desk staff and customers. It tested their maths skills as they weighed suitcases to ensure they were within the required limit. Other role plays included the children posing as security staff, scanning each other and looking at the images on the x-ray scanner. They were shown around the airport and met with various people who carry out a diverse range of jobs such as the foreign currency exchange team, retail staff, engineers, cleaners and baggage staff. The children were even taken up the old air traffic control tower which gave them views across Manchester. Cllr Nicole Meardon, Cabinet Member for Children and Young People, said: “This visit provided our school children with valuable experiences which we hope will inspire them and make them consider the different types of jobs they could aspire to in the future. “The children met lots of people doing jobs that they wouldn’t have thought of. The airport created worksheets and quizzes to ensure the children were thinking about different careers during the day. The schools which visited the airport included Hebden Green Special School, Oaklands Special School, Darnhall Primary School, Grange Primary School and Over St John’s Primary School. Lea Van Rensburg, a parent of one of the pupils on the visit, said: “The outing to Manchester Airport was a positive experience for my daughter Elyse and all of her classmates. The run up to the trip was very exciting and she was looking forward to seeing how it all works and all the work involved in making things run smoothly. Wendy Sinfield, Community Relations Manager at Manchester Airport, said: “We were delighted to welcome pupils from across Winsford to the airport for a taste of airport life. We hope trying out some of the different roles available here will have helped them with their school work, and even inspired them for future careers. The Raising Aspirations Project is part of the Council’s Winsford Whole Place Programme. It will become even more beneficial to young people if other industries or colleges are willing to offer their support by introducing the children to the world of further education and employment. To register your interest, contact Janet Kolita on janet.kolita@cheshirewestandchester.gov.uk.